I feel like for the last 4 years or so I've been on a constant search for the perfect foundation. I couldn't even tell you how many different products I've tried, although I do currently have 6 different half empty bottles in my collection. Up until recently I'd kind of given up on high street / drugstore foundations as I hadn't found one that I felt was as good as the more expensive brands (my favourites being Chanel Vitalumiere and Origins Plantscription), buuuuuut that was until I discovered the No7 Instant Radiance Foundation. It it without a doubt the BEST foundation I have tried in the last few years - high street or otherwise. It has a fairly light but buildable coverage, with a beautiful radiant finish that makes my skin look amaaaaazing. When I met up with my pal Kirsty recently she said "whatever make up you are wearing, you need to wear it all the time because your skin looks unbelievable". So I took her advice and it pretty much hasn't been off my face since, I'm even on to my second bottle which is almost unheard of for me. The staying power is also really impressive - normally by the end of the day my foundation has slipped off or sunk into my pores, but not this - yeah it doesn't look as "done" as it was when I left in the morning, but I don't feel the need to top up if I'm going out for dinner after work like I used to. I also think the staying power is in part due to the help of my next favourite….. When I went to repurchase the No7 foundation above they had an offer on (buy one get the other half price) so I ended up buying their Stay Perfect Primer too as my Clarins Instant Smooth was about to run out. I love the texture of this, it reminds me of the Hourglass Mineral Veil primer which I tried a couple of years ago (I really liked it, but couldn't justify the high cost) - a smooth formula with a thinner consistency than the Clarins one. It's oil free but contains silica so if your skin doesn't like silicons then it may not be for you (I've had no problems). I love how my skin feels after I've applied this, so smooth and matte with evened out pores. It's the perfect partner to the radiance foundation, and I can't see myself switching up my routine any time soon. If you want to see them "in action" then check out my latest Get Ready With Me video. A new addition to my night-time skincare routine is the Hydraluron Moisture Jelly - again, purchased because it was on offer. As the name suggests, it has a jelly like texture so it feels lovely and cooling on the skin. The directions for use say you should apply morning and evening but I tend to just use it at night because it needs a little bit more time to sink it than my usual moisturiser (Origins Make a Difference+). I say a little bit more time, but I mean it takes like 10 minutes which isn't bad at all but I am waaaay too impatient. In the morning my skin feels like it's had a proper treat - all soft and supple like I've had a facial. I highly recommend it! The pot has the added novelty of a push-pop style dispenser function which I get way too much joy from. If you watched my last haul video you'll have seen me discover this with some excitement. I put this on my wishlist after seeing few beauty youtubers use it in tutorials, so I was super excited when I unwrapped it on Christmas morning (thanks B!). 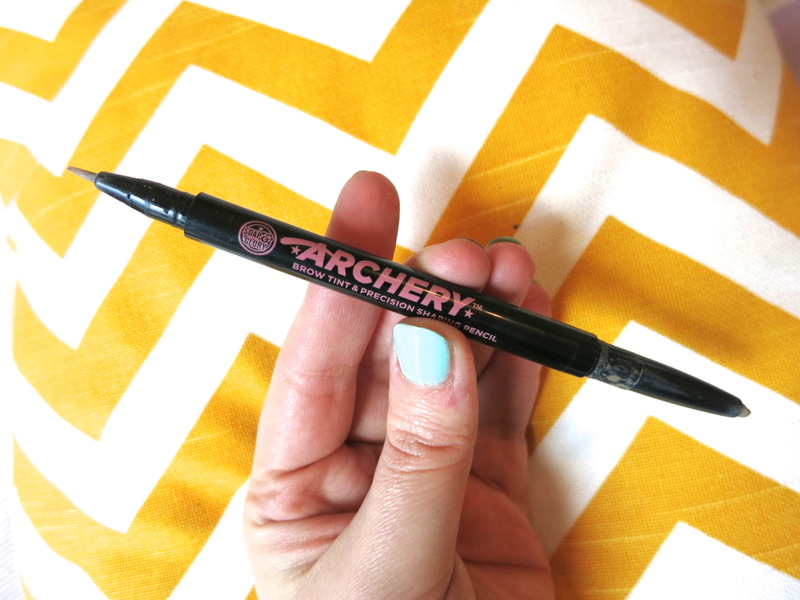 To put it bluntly, this product has completely transformed my brows. I love both ends and tend to just go with whichever one I happen to open in the morning. They both give a really precise finish - the thin brush/pen is great for filling in gaps and the waxy pencil is great for shaping. Love it! For ref, I've got the shade Love is Blonde. A couple of years ago I used to get a monthly Glossybox subscription and I got a sample of this perfume and completely fell in love with it. I remember looking it up online to try buy the full bottle and was horrified to discover that it cost in the region of £300. How gutting?! There was no way I could justify spending that on a perfume so I resorted to just trying to make the tiny sample last as long as possible. Once it ran out I just threw the vial in the bin and forgot all about it until very recently when I decided I wanted to buy a new perfume and whilst trying to think of ones I'd sampled in the past I suddenly remembered my much loved Bond No9 sample. As it was now about 3 years old the cost had gone waaay down and I was able to find it for just under £100 on a couple of perfume websites. I still felt like that was a bit much for a perfume though (especially since I'm currently saving for a wedding and am trying to curb frivolous spending) so decided that I would do some ebay selling to make the money (a bit like when you're little and you have to save up pocket money for something). 8 dresses later and I had just over £100 in my Paypal account so was ready to treat myself to my dream perfume. The minute it arrived at work I actually took it out and sprayed it on my wrists and did a totally cliched "ahhhhhh" sigh at just how beautiful it smelt. I'm rubbish at describing scents but it's very floral and quite "grown up" if you know what I mean, like it smells like the perfume fitting for a 30 year old, more so than some of the more sweet smelling perfumes I have in my collection. Btw the website I bought it from for £99 no longer has it in stock and everywhere else is £140 plus so that's why I've not bothered with a "buy me" link above. So that's my current favourite makeup and beauty products - I am literally using all of these on a daily basis at the moment, especially the foundation and primer. I'd love to know if you've tried any of these too?